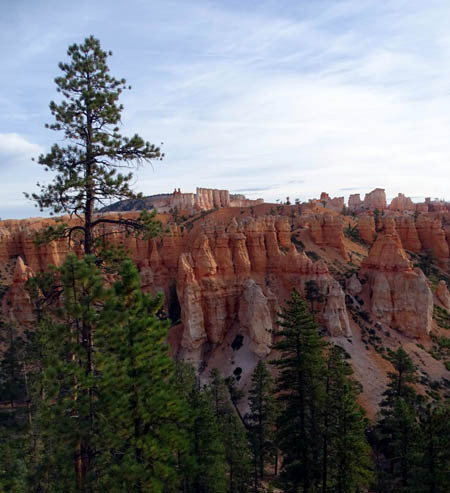 "You'll see more grandeur and beauty than you can imagine on your visit to Bryce Canyon. man's oldest (and most reliable) mode of transportation." 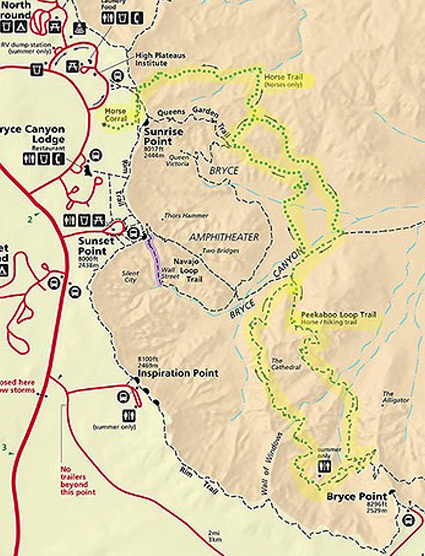 In the last entry, a three-pager because of all the pictures, I described the spectacular Peekaboo Loop Trail in detail and provided a virtual tour so folks can see what it's like. Peekaboo is rated as "strenuous" by the National Park Service because it has a lot of elevation gain and loss, some parts of it are steep up or down, there is some loose rock, it's at high altitudes (approximately 7,000 to 8,000 feet elevation), and the sun can feel quite hot even when the temperature is in the 50s or 60s F.
In addition, the only way to reach the three-mile loop is from two other trails that add another two or three miles to the total distance. 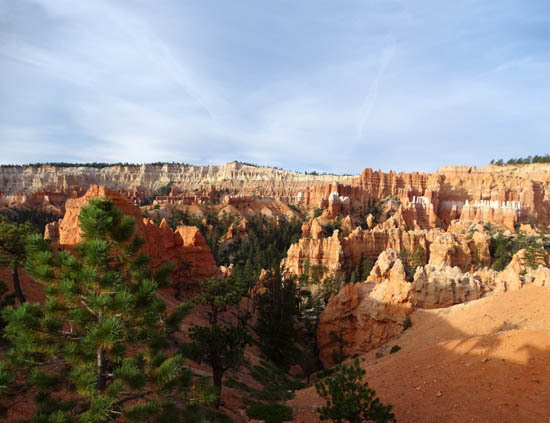 Not every park visitor has the time or ability for such a challenging hike down into magnificent Bryce Amphitheater. 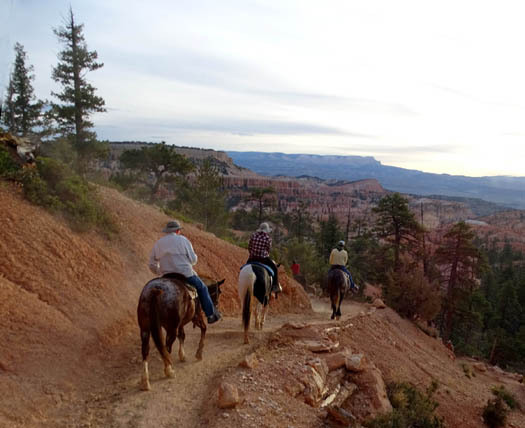 A good option for some folks is to take one of the two daily horseback rides with guides from the park's horse concessionaire, Canyon Trail Rides, Inc. I marked the half-day ride that Jim and I took in yellow. 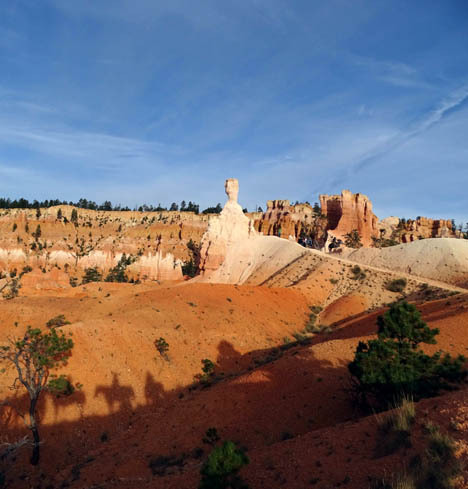 The Peekaboo Loop is the only hiking trail that horses can use in Bryce Canyon. Note the arrows that indicate which way the horses ride. 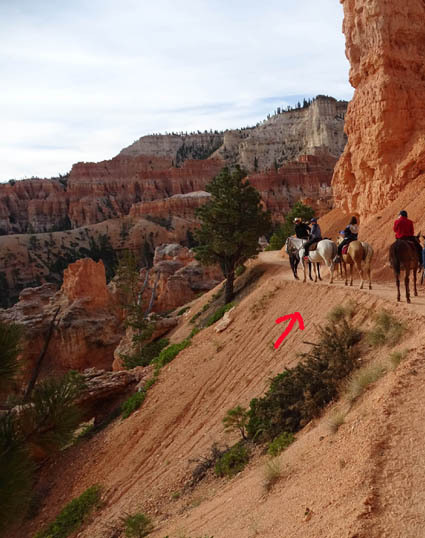 Hikers can go either way on the Peekaboo Loop; they are not supposed to walk on the Horse Trail. Jim and I were able to take this season's last half-day ride at the end of September. It was fun!! 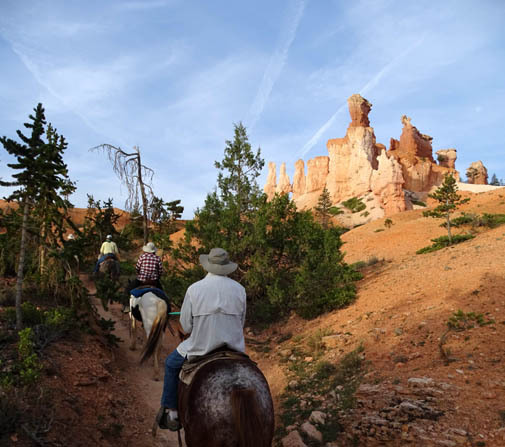 "Half-day" (three- to fou-hour) rides on the Horse Trail and Peekaboo Loop are provided by the concessionaire each morning during the busier parts of the season, approximately May through September, and two-hour rides on just the Horse Trail each afternoon. 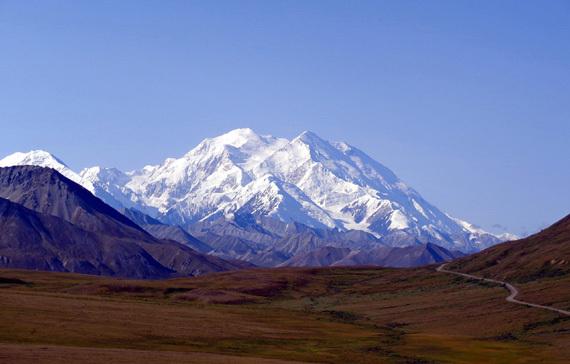 The season for the shorter rides is usually longer, from April through October. Dates vary with the weather conditions. Only ten people are allowed in each group. If enough people want to ride, a second or third group -- each with a guide -- goes out a few minutes after the one in front of it. Jim (in white sun shirt) was 7th in our group of 10 riders + guide, and I was 8th. We inquired about the half-day ride just one day before we went. We waited to be sure the weather would be good for our ride, and you can't always tell that very far in advance. We learned that the next day was the last one for the half-day rides that include Peekaboo and it was booked up. However, we paid the fee and got on a stand-by list in case 1) someone didn't show up or 2) they added another group. 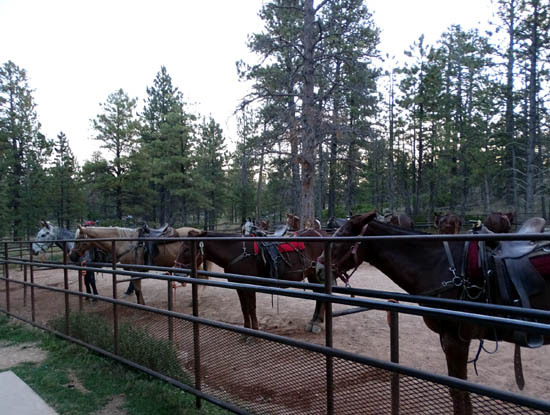 Horses and mules wait patiently in the corral before the morning ride. 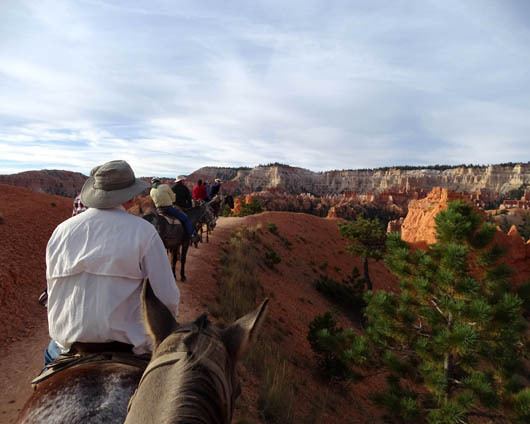 This season the morning rides began at or before 8 AM and returned to the corral near the lodge about 11:30 AM. Our cost was $80 each and we both felt like we got our money's worth. 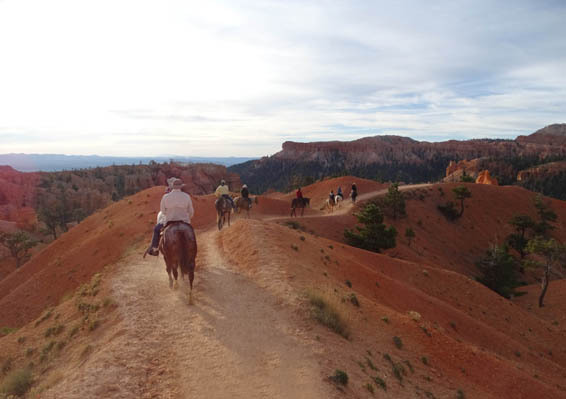 Even though I'd already hiked Peekaboo twice and Jim had hiked it once, five miles of the ride are on the Horse Trail and we never would have seen that part of the park if we hadn't been on horseback. Waiting for the ride to start, Jim looks like he does this all the time! 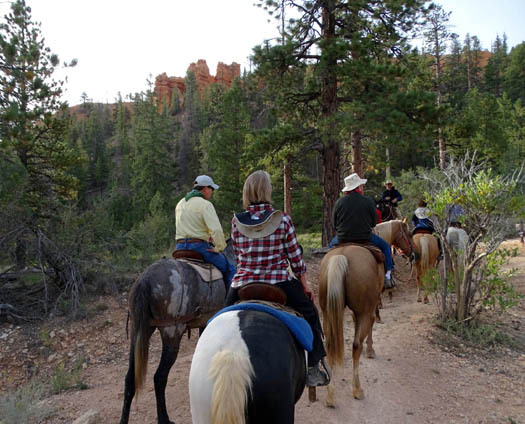 Canyon Trail Rides, Inc. uses both horses and mules. All of them in the corral appeared pretty gentle, although apparently some don't get along with each other real well on the trail. Everyone was supposed to stay in their original order throughout the ride for that reason. One man announced each rider's name and the name of the horse he/she would be riding. 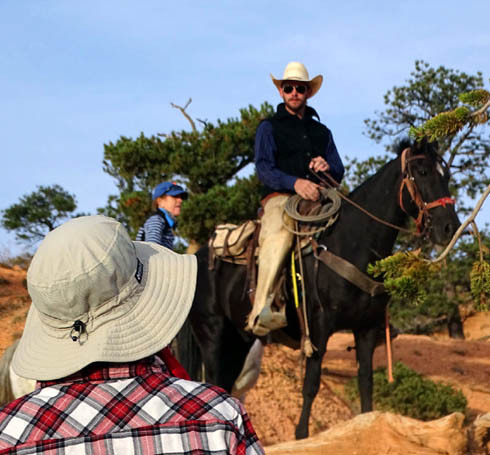 Other cowboys led us to our horses and talked briefly with each person to ascertain his/her level of experience and comfort with horses. 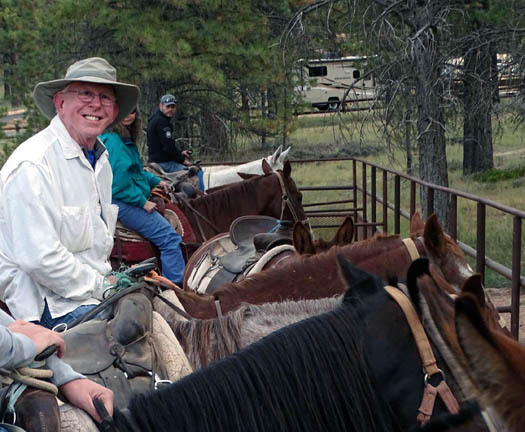 They reiterated the name of our horse, helped us get in the saddle, and adjusted our stirrups. 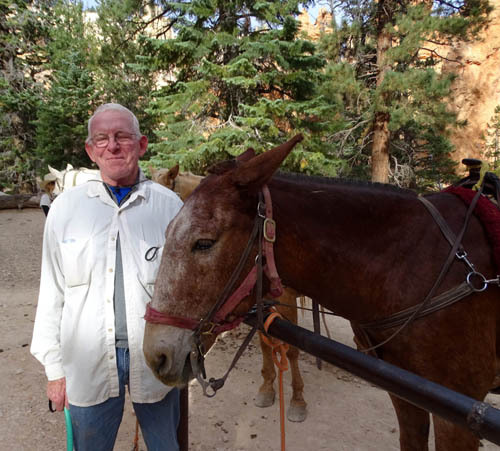 For inexperienced folks like Jim and me, they also explained how to hold the reins and how to signal various commands to the horse with the reins or our feet. Even though I have long legs I'm not as flexible as I used to be and it was a huge step up and down for me from the stirrup since Moqui is so tall. A cowboy assisted at the start, the middle rest stop, and the end but it would have been a lot easier with a step stool. Jim was assigned to a handsome red male horse named Red River. He and Moqui ride well together so I was instructed to follow right behind Jim for the whole ride. Jim stands by Red River during our rest break halfway through the ride. I didn't know what "Moqui" meant until I got back home and looked it up online. 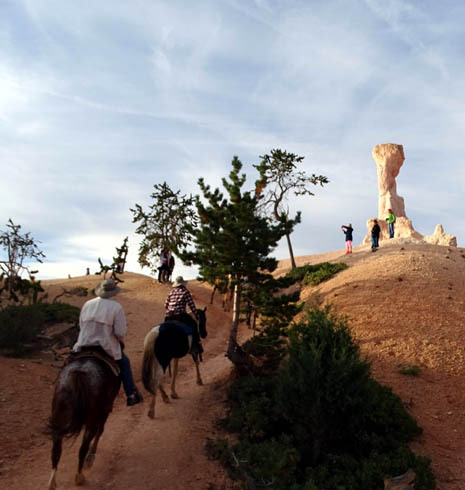 It's a Hopi term and there is also a local rock called "Moqui marbles." 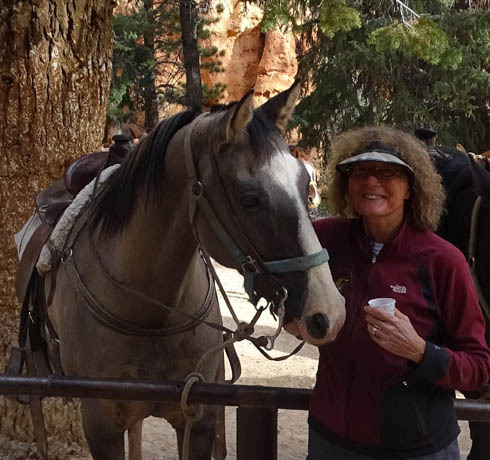 The little round rocks are the same grayish-brown color as this horse so it was a great name for him. I also researched the coat color of the horse, which is called "grullo" or "grulla." Tim, our group's guide, told me that term but I didn't know how to spell it so I looked it up online, too. After our ride I noticed while hiking how many hoof prints were on or over the edge of some of the slopes on the Peekaboo Loop. Yikes! 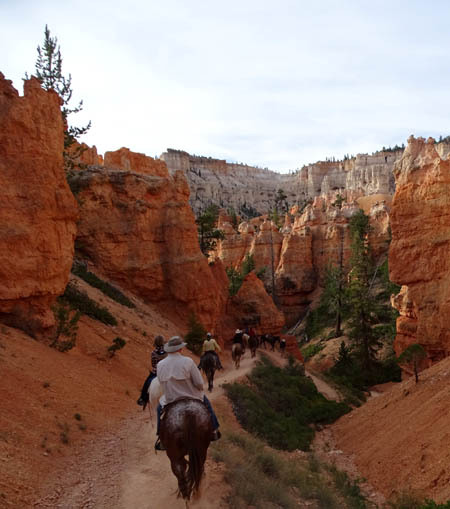 Other than getting too close to the edge a few times, both of our horses were pretty easy to control. Moqui wanted to go faster uphill than Red River and I had to rein him back. I didn't have to pull right or left; he just followed the herd. He's done this numerous times! It was interesting to see five miles of trail that were new to us. Tim, our guide (next photo), stopped occasionally to point out rock formations that have been named, to provide information about the geology of the park, and to answer questions. Moqui's so sweet -- can I keep him??? Riders weren't allowed to carry backpacks or water so the guide gave us cups of water here. 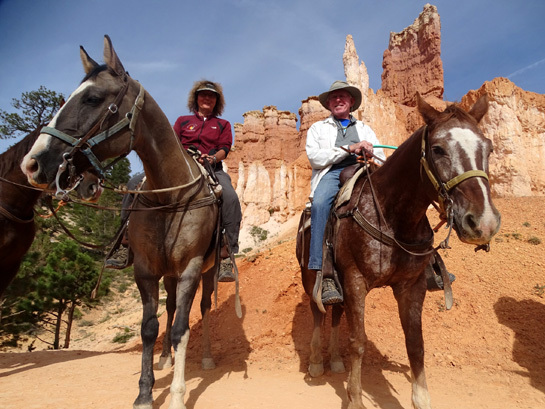 Jim and I both took photos during our ride, although it was harder to take pictures while hanging on to the reins or saddle horn. 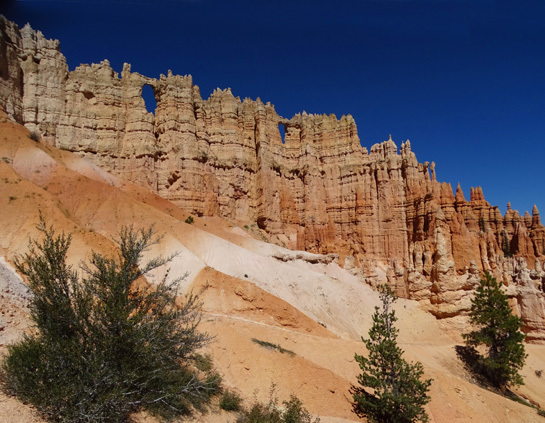 The remainder of the photos show more of the scenery during our ride. some hikers have walked over to take pictures of the horses. Above and below: We had good views from this ridge.